Draken has had two successful Kickstarters: the Tagula and the Peregrine. Both have done very well, and now Draken has come out with the new model on Kickstarter, the Kalahari. There will be two versions of the Kalahari: a black PVD version with cream color face and a stainless steel version with black face. Draken was able send me the prototypes to review and these are even better then I thought. Lets take a look at these desert military beasts. Not designed for elegance, the Draken Kalahari is made to be a tough and aggressive looking desert military watch. Looking at the dial on Kalahari you can see right away that it takes inspiration from the aviation world. The power reserve indicator is inspired by the altimeter in vintage aviation dials. The skeletonized hands also look like they were taken right off of an altimeter. The sandwich dial design with the date wheel, power reserve disk, and inner rotating bezel, really give a great three dimensional look to this watch. The Draken Kalahari comes in either a stainless steel case or the black PVD case. Other than the finish, both cases are identical. Measuring in at 44mm wide, 51.3mm lug to lug, and 15.1mm thick, this is a good sized watch and is exactly the size I like. There are two screw down crowns; one for setting the time, and one for the internal rotating GMT bezel. The case back is screw down and has a large Draken logo which is filled with lume. It looks very cool in the dark. Water resistance for this case is 100 meters. 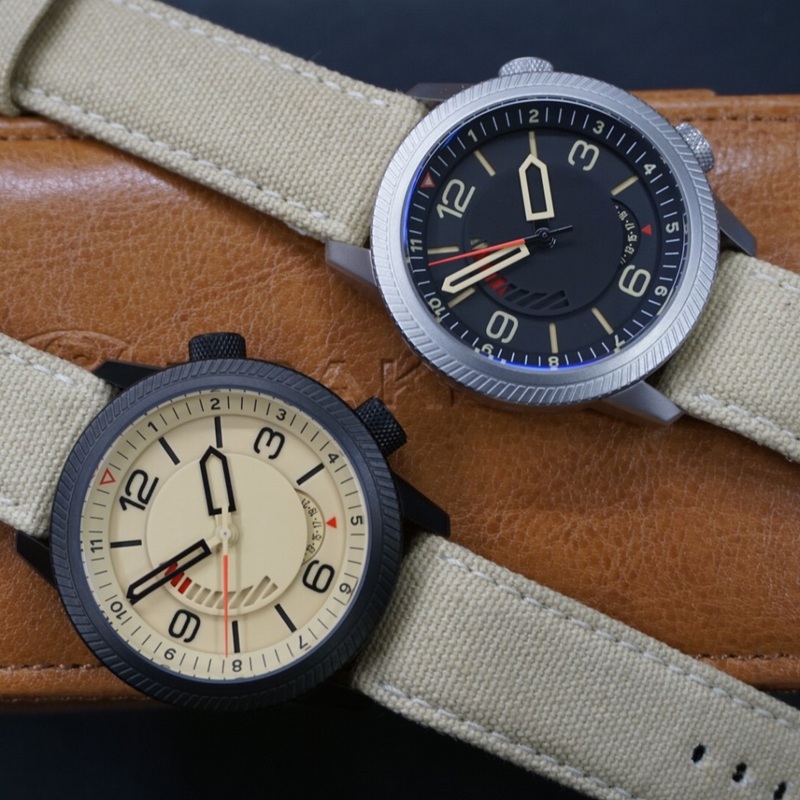 Both versions of the Draken Kalahari comes with the same tan canvas strap. These straps are very durable feeling and fit very well. Since these are prototypes and have been passed along from reviewer to reviewer, I assume they are well broken in. They are very well made and seem as though they can take a lot of abuse. The black PVD version comes with a black pin and buckle clasp and the stainless model comes with the stainless clasp. Draken has done well with this model for sure. Both versions of the Kalahari have excellent lume. If you get the stainless steel version, the lume will come from the painted hands and hour markers. There is even lume on the date wheel. Now the black pvd version takes it to a whole new level. The entire face is painted in lume, including the date wheel. All of the hands and text remain black. Draken has used a sand colored luminous paint to give it that desert military look. I must say, on the Kalahari the lume really looks fantastic. If you’re looking for a cool rugged field watch, you might want to go and check this one out. Early bird pricing on this starts at $450 USD. Not a bad price at all for a watch of this quality. The build quality is excellent and it has a very reliable Seiko NE57 automatic movement. If this is your style watch, I suggest that you go check them out and back them. You can check them out on Kickstarter. Who’s it for: Field and aviation watch fans. What I’d change: Put name or brand logo on the dial. The best thing about it: Dial design. Moulded and painted case back.